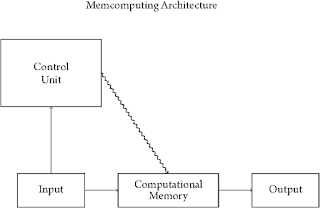 Memcomputing is a new computing paradigm that is based on the idea that the memory can and should be used to compute. The idea is based on the functionality of the brain where neurons are used to both store information and process it. In particular the following drawing shows the way a memecomputer operates. The zigzag arrow specifies that a signal is sent. All other arrows designate flow of information. Today I was informed that Jonathan Wayne Mills, the creator of an implementation of the Extended Analog Machine passed away on January 27, 2016 at the age pf 64 after a six month fight against cancer. I am really saddened when I hear such tragic news.